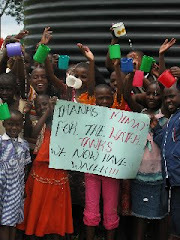 At Sabina, the Food Water Security program is going strong. Extensive plantations around the school are providing a significant proportion of the food eaten by the children at Sabina. Importantly this food is diverse, fresh and nutritious. The staff at Sabina are also using the garden as a teaching tool, newly invigorated by the recent visit of Prue Gill, teaching educator from Australia. Under the direction of James Kalokala, big crops such as maize, banana (many varieties), cassava, coffee, sweet potato, and beans are all very productive. 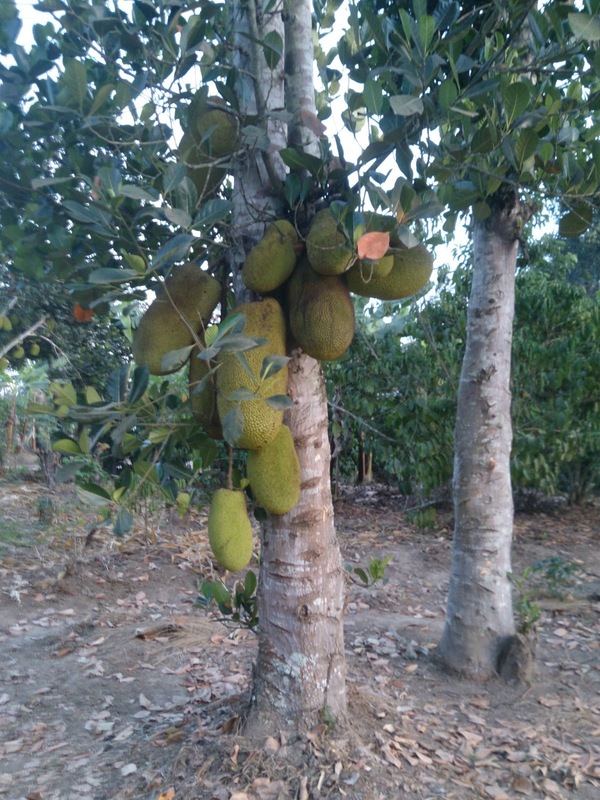 Intermingled throughout are fruit trees such as mango, jackfruit, and avocado. Pineapple and passionfruit provide delicious extra fruit treats and variety to an already good fresh food base. 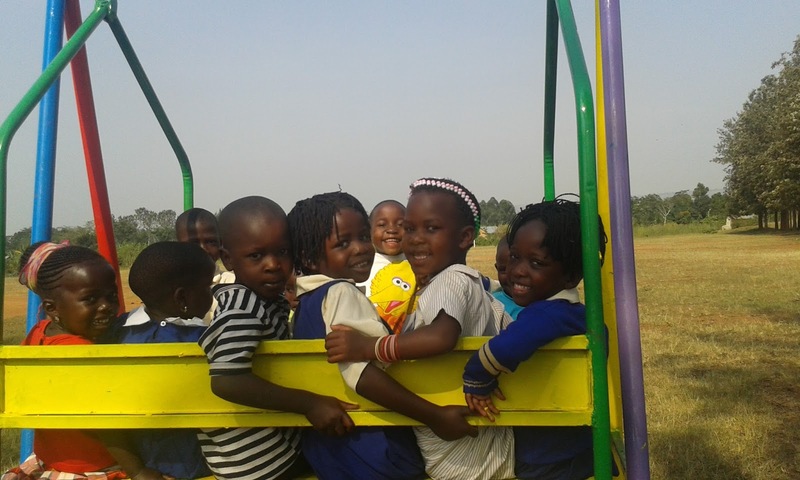 As an example of the extent to which the food production areas are contributing to the improved diet of children at the school, last year (2014), 900 kg of maize was produced, 400 kg of which was given to the children fresh, with the remainder made into flour. The extent of land under production has also increased the direction of James Kalokala, producing a higher percentage of the food requirements of the children at Sabina and, importantly, providing it in fresh, nutritious form. Plans are afoot to reinvigorate the area of production dedicated to smaller leafy greens such as kale, mints, and other horticultural crops. There are now approximately 500 chickens, providing each child with one egg per week with the rest sold in Sssanje, the local village. Proceeds are used to run the food production program. One of the goals for 2015 is for the school to develop a solid understanding of the economic value of the food production to the school in terms of cost savings on purchased food. This will assist with securing ongoing support for the program. 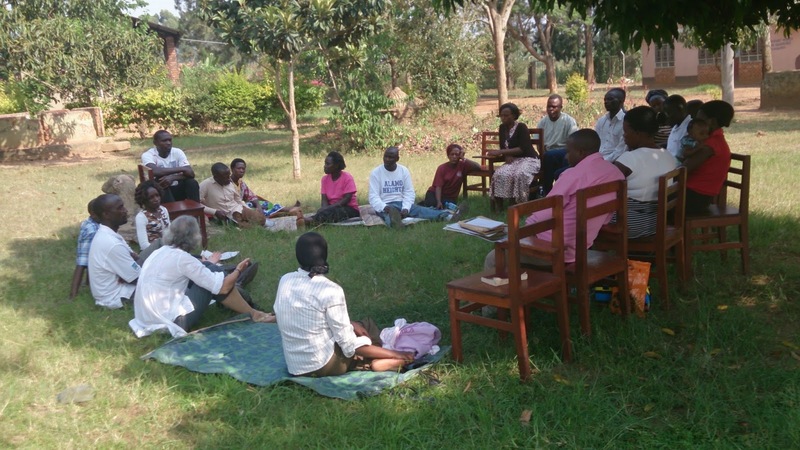 Among Sabina staff there is a deepening understanding of the educational value of using the unique sustainable agricultural activities to reinforce educational skills and understandings. Every class, from P3 upward is timetabled into the garden each week and teachers are using the garden for hands-on learning in maths and science. 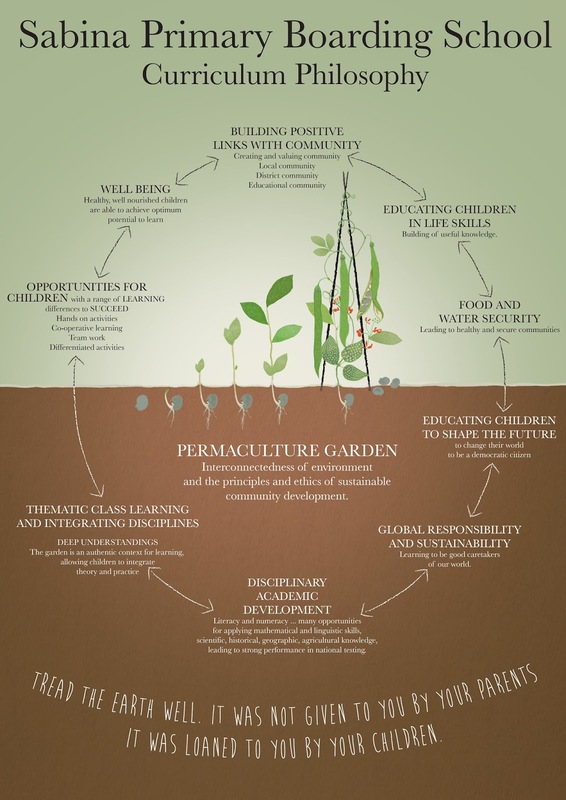 This poster captures the school curriculum philosophy with food production at the heart. It is a work-in-progress - changes suggested by teachers during the recent workshops run by Prue Gill will be incorporated into the next version. Each teacher has their own copy, and there are several other posters being prepared for classrooms covering issues such as rights and responsibilities, and the principles of 'hands on learning'. 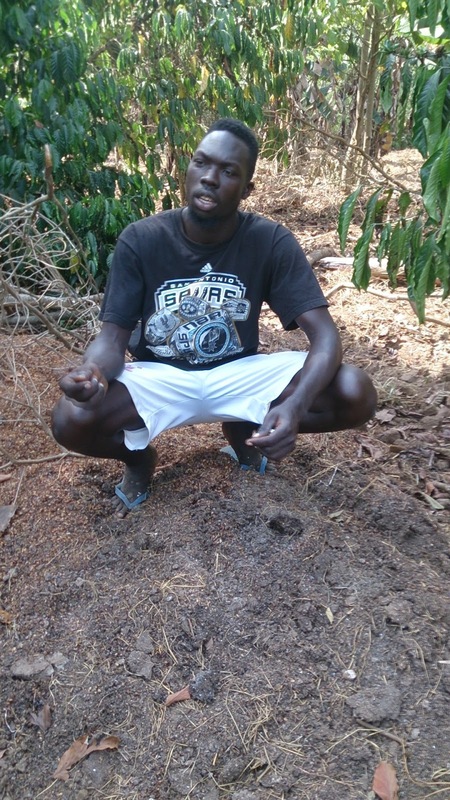 Former students and permaculture-certificate holders Sharon Namubiru, Nyero Christopher, and Charles Mugarura return often, joined by other young Ugandans interested in sustainability eduction, such as Paul Musisi. The school's food-water-security program has the support of Godfrey Kiwanuka, District Production and Marketing Officer, who has invited Sabina to be a recipient of Uganda's Operation Wealth Creation (OWC), an outreach across Uganda to deliver agricultural inputs to villagers. ‪Mike Openshaw‬. Just saw the remote plantations a few days ago. When the rainy season starts, they will have an incredible variety of food, especially sweet potatoes. Had some luscious jackfruit obtainable only by the very tall and gracious Nyeromeister VanNyero Christopher. Walked 8 miles that day on my new knee; knees were fine, but muscles and heat exhaustion required a half day of recovery. ‪Paul Zaake‬ I love this place and as a home, it is always on my heart. These smiles make me remember the childhood moments and the most recent moments (few days back) sitting in these gardens at night taking sodas,...and our elders like sister Jan Smart sipping a beer with other friends while looking at the blossoming of the full moon and discussing about the plans. ‪Jan Smart‬. ‪Paul Zaake‬ that was a beautiful evening, sitting in front of the bandas, with the full moon, with A/Prue, and such lively, young members of the COU family: you; ‪Mugarura Charles‬, ‪Sharon Namubiru‬, ‪Julius Agaba‬,‪Nyeromeister VanNyero Christopher‬, ‪Musisi Paul‬, and JB. Thanks for the company, and for the memories. ‪JB Ssemanda‬ Really I appreciate COU administration for the struggle to bring up happy lives of many children! I too can remember those days just as said by A/‪Jan Smart‬; also with A/Kim & U/‪Clive Mullett‬. We enjoyed so much and bandas had such a lovely temperature that everyone needed! Weldone and thanks for the great work. Woow!Thanks to all of you who have managed to embark on this program as it has been before! Can't wait to join you there soon with new ideas too!Permaculture Oyee! !Thanks Aunt Jan, Aunt Prue ET Aunt Anne for your great ideas. CBSE, the major panel in the India encourages most of the parent to opt for CBSE centered educational institutions for their kids to research. CBSE Schools are recommended, especially, by parent in whole of the NCR area as CBSE’s head office happens to be in Delhi itself. Well managed.I appreciate for your commitment. And finally thanks for sharing this.